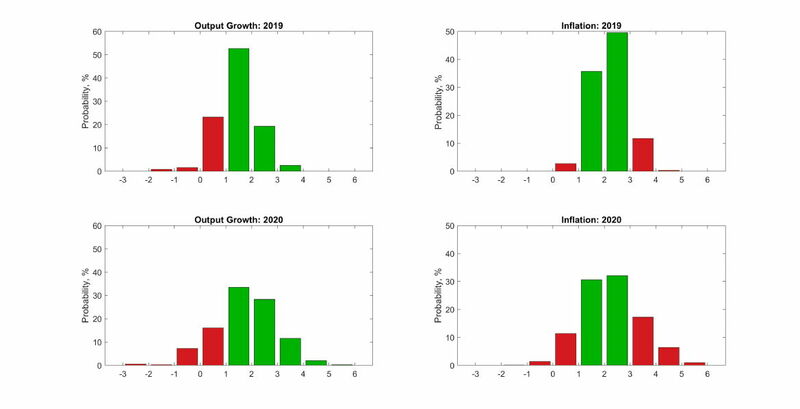 The figure below presents WBS’s latest (as of 11th February 2019) probabilistic forecasts for real GDP growth and inflation – for 2019 and 2020 – as histograms. Conditioning on the latest GDP data from the ONS for 2018Q4, the figure and Table 1 below show the WBS forecasting system to predict that it is most likely (with 52% probability) that economic growth in 2019 is between 1% and 2%. There is, however, close to a 1-in-4 chance that growth is less than 1%; and a 80% chance than growth is less than 2% in 2019. One quarter ago, the WBS forecasting system predicted a 50% chance than growth would be less than 2%: so downside risks have increased. Looking out to 2020 uncertainty increases, with a higher chance, at 24%, of growth less than 1% and a 58% chance of growth less than 2%. While the most likely forecast outcome is that inflation falls in its target range, between 1% and 3%, the WBS forecasting system predicts that the chances of inflation breaching this target increase from 15%, in 2019, to 38% in 2020. Inflation risks are on the upside: the WBS forecasting system forecasts a 25% chance that inflation exceeds 3% in 2020 relative to a smaller 13% chance that inflation falls below 1%. Accordingly, we take the most recent point forecasts from the Bank of England, the IMF and the OECD. While the Bank of England provide an explicit assessment of forecast uncertainties for the UK, via “fan charts”, the IMF and the OECD provide point forecasts only. Table 2 shows that forecasters are more pessimistic about GDP growth in both 2019 and 2020 than the WBS forecasting system, as the probability of a higher outturn is in general more than 50%. The Bank of England, in particular, is more pessimistic about GDP growth prospects in 2019, We also observe a more pessimistic output growth forecast scenario from the OECD, especially for 2020. There is less disagreement about inflation, especially in 2020. All three forecasters, like the WBS forecasting system, forecast that inflation is most likely to be around 2%. But the WBS forecasting system does forecast a little more inflation than the Bank of England in 2019, suggesting there is a 62% chance that inflation turns out higher than the Bank’s point estimate of 2%.